"Those engaged in World Social Forum process all over the planet hope it will continue its way inside the United States, to make possible the building of a new world of justice, peace, and love. I am sure this book will play an important role in this walk." "As the global political order reels from bank failures, rising energy and food prices, and increasingly urgent fiscal crises, activists and critical intellectuals are proposing sustainable alternatives to globalized capitalism. A major site for these debates has been the World Social Forum process, which began in 2001 and has since then mobilized people around the world at the global, regional, and local levels. This book documents this process, informs activists and scholars about the lessons it offers, and analyzes the strengths and weaknesses of the Forum process as it has moved from Latin America, to Africa and Asia and even--in the form of the U.S. Social Forum--to 'the belly of the hegemon.'" 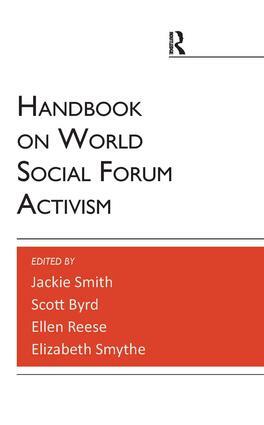 "A superb collection, documenting the importance of the World Social Forum in creating a new vision for our movement and our world." —Maude Barlow, National Chairperson of The Council of Canadians, cofounder of the Blue Planet Project, and 2005 recipient of the Right Livelihood Award.